This exhibition comprises documentary photographs, maps, and archival materials focused on the urban space of Phnom Penh's corners. Photographers Prum Ero captures the varied architecture and everyday life at the rounded and angular corner buildings from the perspective of the street walker. 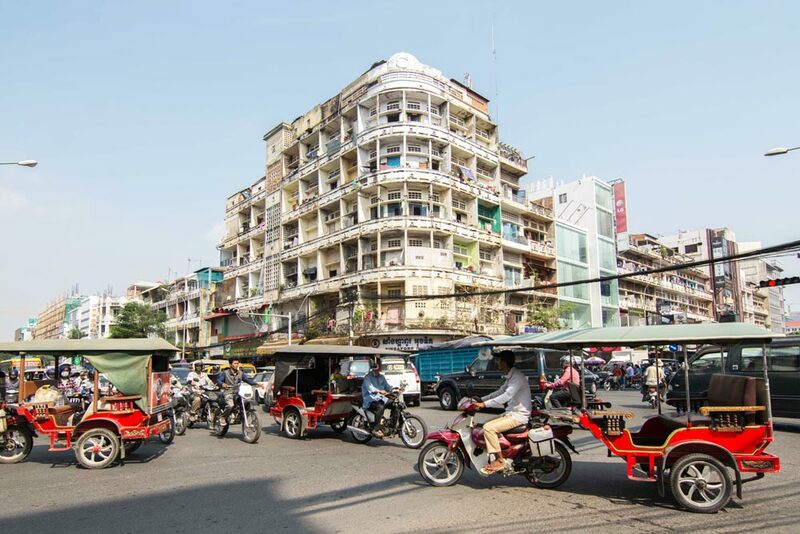 His selection of images is mapped around five of the capital's main markets including Central, Kandal, Old, Olympic, and Orussey Markets, revealing a wide range of adaptations to original structues built between the 1910s-1980s. Driven by an impulse to record for future generations' reference. Prum's titles combine the directional and street indications with the date of documentation. Prum Ero’s emerging practice focuses on the documentary in digital photography and video. He was born in 1989 in Phnom Penh, lived in Banlung, Ratanikiri from 2006-2014, and currently lives and works in Phnom Penh. His photographs have been published in the Cambodia Daily and his photo-essay commissions include with Gallery Magazine, National Gallery of Victoria and Fah Thai. He works in production for artist’s films including Korean artist Hyun-Suk Seo’s documentary on Vann Molyvann (2014-2015) and Thai artist Arin Rungjang’s documentary set in Ratanikiri (2015). His work was exhibited in Sangker Memories, the inaugural show of Sangker Art Space, Battambang in 2014. Documents: Phnom Penh’s Corner Architecture at Bophana marks his first solo exhibition. Prum holds a BA and is obtaining an MA in Business at Build Bright University.